Cream the butter with the sugar. Add the eggs. vanilla, baking powder, salt and flour. (You may need to add a little more flour to attain the proper consistency). As you mix you will need to switch to kneading the dough. Add more flour until dough no longer sticks to your hands. Roll into pieces about 9 inches long and about 1/2 inch thick. 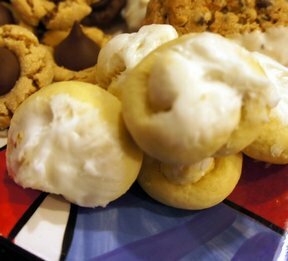 Cut into 3 equal pieces and braid each cookie. You may vary size depending upon your preference. Bake on greased baking sheet in a preheated 350° oven for 10 to 15 minutes until done.